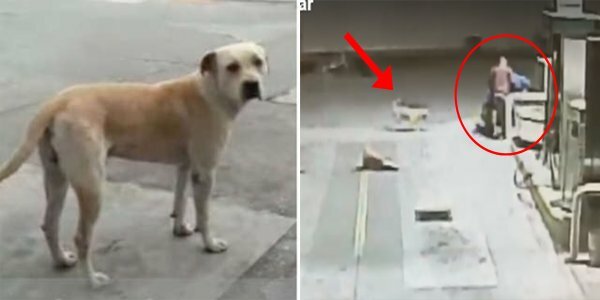 Meet Randy, a formidable dog who has earned himself the reputation of “hero” in the town of Tamaulipas, Mexico. Two years ago, Randy showed up to a gas station in the town. Because of his tattered state, the staff took immediate notice of him. He didn’t seem aggressive, just dirty, malnourished, and skittish of humans. So, over time, they worked to gain his trust. Eventually, Gerardo Aguilar, the station’s owner, decided to “adopt” Randy. Last week, Randy revealed his heroic side when two armed robbers arrived at the station. They confronted the attendant on duty and demanded he open up the office where the money is stored. As The Dodo reports, they assaulted the worker, punching him and knocking him to the ground. However, the attendant wasn’t outnumbered for long. Randy, who sleeps in the station’s warehouse, heard the commotion and immediately rushed in. His ferocity drove the robbers away, and likely saved the gas station worker’s life. Having Randy around is clearly good for business — in more ways than one.
? African Elephants Are Evolving To Be Tusk-Less To Survive Poachers 12 Quotes By Ernest Hemingway That Will Make Your Life Richer ?